Regulatory requirements for information security will only continue to grow and evolve. Stay ahead of the curve by anticipating regulatory dynamics and implementing an information security program that can accommodate and adapt to change. Compliance should be a security enabler, not an impediment. Our consultants can architect an effective approach to compliance that will keep your staff – and your auditors – focused on what matters most. Our integrated approach to compliance streamlines control mapping and minimizes administrative burdens. Let Avalution focus on compliance so that you can focus on running your business. Tired of IT auditors preventing you from focusing on information security priorities? Most information security compliance programs are responsive in nature and evolved in silos. Our approach to compliance aligns controls to a common framework and consolidates assessment activities. Whether you’ve been complying for decades or just entered a new market, our consultants have the expertise and experience to help you efficiently achieve readiness and compliance. Practice areas include: FERPA, FFIEC, HIPAA, NYDFS, PCI-DSS, Sarbanes-Oxley. While statutory privacy regulation continues to lag industry regulation, the General Data Protection Regulation (GDPR) has set a new bar that will most likely be leveraged by other jurisdictions in lieu of growing constituent concern over privacy. 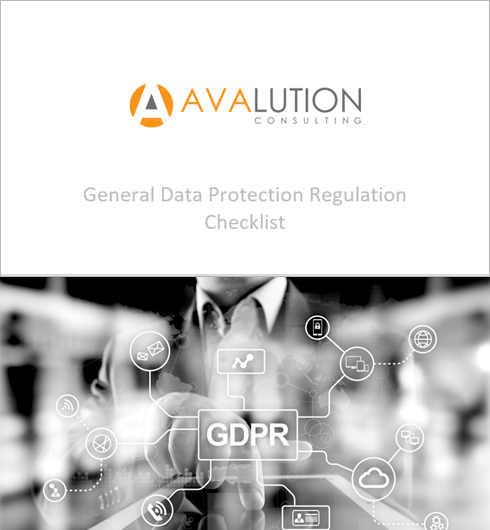 Even if you are not sure if you need to comply, Avalution’s GDPR readiness program can help you stay ahead of the curve and be prepared when (not if) you do. Check out our GDPR Checklist, which will help ensure you haven’t missed any critical requirements of the regulation. Many regulations, including GDPR, now require that companies demonstrate security through formal program assessments. Whether you are looking for ISO 27001 certification or a clean SOC 2 report, Avalution can help implement your program and prepare you for your audit. Just because they are required doesn’t mean that they can’t add value. Whether you are looking for a general controls audit or need expertise with specific systems, our Certified Information Systems Auditors can augment your team and provide the expertise necessary to meet your audit objectives. Compliance Should Enhance Security, Not Impede It. Stop letting compliance requirements interfere with your information security operations. Avalution can streamline compliance and alleviate the burden on your company. Please contact us today to discuss your needs. We are optimally positioned to guide you through the process of assessing risk, anticipating threats, and implementing cost-effective strategies to defend your enterprise. The General Data Protection Regulation (GDPR) is the most comprehensive personal data privacy regulation ever issued. With the potential fines accompanying noncompliance, GDPR has many organizations asking themselves if they are on track to meet the regulation’s requirements. While this checklist is not inclusive of every GDPR requirement, it will help you make sure that you have not missed any critical requirements of the regulation.